On the left you will find topics covering the changing face of Prestwich through the ages. Or use the search below. Argent on a Pile between two Roses Gules barbed and seeded proper two swan's Heads erased Ermine in Chief and a Fleur-de-lys of the first in base. Silver (often shown white) on a triangle between two Red Roses showing their thorns and centres in their natural colours. Two swans heads torn off to leave ragged edges, black tails on a white background in a horizontal bar across the top, and a Fleur-de-lys at the base. On a Wreath of the Colours: a Lozenge Azure charged with a Fleur-de-lys Argent between two Roses Gules barbed and seeded proper. On a Wreath of Colours, a blue Diamond with a silver Fleur-de-lys, between two Red Roses showing their thorns and centres in their natural colours. To the dexter a wyvern reguardant Or and to the sinister a Lion reguardent Argent each gorged with a riband and suspended therefrom a Lozenge Azure charged with a Fleur-de-lys Argent. To the left as viewed, a golden (often showed yellow) two legged dragon looking backwards, to the right as viewed a Lion looking backwards, each with a ribbon around the neck, suspended from the ribbon a blue diamond and silver Fleur-de-lys. Two swans originate from the Arms of Baron Cawley of Prestwich who was the Charter Mayor in 1939. Fleur-de-lys represent St Mary as do the blue and white Lozenges. 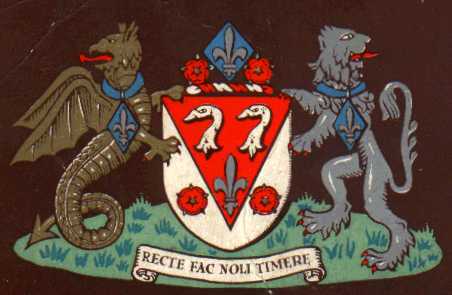 The Wyvern and Lion are from the Arms of the Egerton family.